If there is any truly traditional Irish dish, this is it. It sounds very ordinary, potato and cabbage, and indeed there is nothing at all complex about making it, but the marriage of floury potatoes, wilted greens and rich butter makes for the ultimate in comfort food. It is tasty, filling and easy to make, warming and delicious to eat. Just the thing on a cold winter’s night in front of the fire! There are few foods so popular and loved that they have a whole song about them, and Colcannon has a really great song in its praise. There is not much ‘video’ in this YouTube offering, but Mary Black’s bell like voice, along with those of the rest of the Black family, pay wonderful homage to this simple meal and its place in Irish life. Two recipes here, one for traditional Colcannon with mashed potatoes and another for a very popular (in this house anyway!) ‘modern version’ using caramelised cabbage. Not everyone adds scallions to colcannon, but they do add something worth having in my opinion. Peel and boil the potatoes. Remove the core from the cabbage, slice it thinly, and put into a large saucepan. Cover with boiling water from the kettle and keep at a slow rolling boil until the cabbage is just wilted and has turned a darker green. This can take anything from 3-5 minutes depending on the cabbage. Test it and don’t let it overcook, if anything it should be slightly undercooked. When the cabbage is cooked, drain it well, squeeze to get any excess moisture out, then return to the saucepan. Add one third of the butter and cover. Leave it covered and in a warm place, but not on a burner, with the butter melting gently into it while you continue. When the potatoes are soft, drain and return the saucepan, with the drained potatoes in, to a low burner, leaving the lid off so that any excess moisture can evaporate. When they are perfectly dry, add the milk to the saucepan along with a third of the butter and the chopped scallions if you are using them. Allow the milk to warm but not boil – it is about right when the butter has fully melted into it and it starting to steam. With a potato masher or a fork mash the potatoes thoroughly into the butter/milk mixture. Do NOT pass through a ricer or, worse, beat in a mixer as it will make the potatoes gluey and disgusting. Before serving season with a little salt and sprinkle with fresh parsley or chives. Most importantly, make a well in the centre of the mound of potato and put the last third of the butter in there to melt. I made this once just because I had the ingredients and not a lot else to hand, and wondered if it would work. It is not really colcannon at all I suppose, but does share a lot of ingredients and we always refer to it as ‘modern colcannon’. The caramelised cabbage has a wonderful flavour, it was hugely popular and is now a fairly regular dish in our house. You need to prepare the cabbage in advance, start it about 1½ hours before you need to eat. Put the bacon bits and the thinly sliced leeks into a non-stick pan, without any additional fat, and fry gently until the bacon is just browning and the leeks softening. Discard the tough outer leaves of the cabbage, remove the core and slice thinly. Add to the pan with the leeks and bacon. There will seem to be too much cabbage, but is gets smaller as it cooks. Stir the mixture on the pan over a high heat until the cabbage starts to brown at the edges. Then add the cup of boiling water, turn the heat to medium-low, cover the pan with a lid and cook for one hour (trust me on this!). You will need to check from time to time that the water had not fully evaporated, if it has, top it up a little. After an hour, remove the lid, turn the heat up to high and stir the mixture until it becomes dry – this will probably take about 5-10 minutes. Both cabbage and leeks should be browned and very soft. About 15 mins before the hour is up, put the potatoes on to boil. When cooked, mash as above, using all the milk and butter. Put the mashed potato into an oven proof dish, cover with the cabbage mixture and sprinkle the top with the grated cheddar. Place under a hot grill (broiler) until the cheese is bubbling. Serve with a green salad, it’s a meal in itself. Some recipes say if using bacon or ham in colcannon to cook it the day before-I’m just wondering why? Thank you. I tried it tonight and it was excellent! Can you make it without boiling the kale? I’ve ready that you lose a lot of nutrients when you boil it, so I’m trying to stay away from it, but I still wanted to try it. Will it make it taste differently if you sauteed it or something like that? Basically, I just wanted to drop a note from an obnoxious Yank (my brother’s terms, not mine) who is trying to help people locally find info about different traditional foods and recipes (as well as explanations) from different cultures and backgrounds. What I’ve been finding so far on your site has been helpful, and I wanted to just say thank you for sharing!!! The traditional recipe is exactly the way my mother made this, and she would serve it with brown bread and boiled “corned” pork (pork shoulder marinated in the fridge for a couple of days in salt with some spices and a little sugar, then simmered slowly in water just until tender, often with traditional boiling vegs like potatoes, carrots and cabbage). Hi I’m from Dublin too and we always had cabaiste and pototoes at virtually every meal. We loved it, not moaning mam. We used savoy cabbage and mam added a small pinch of bread soda to the cabbage when it was boiling to soften it up. Thanks so much for this site. I am attending a Celtic Celebration of St. Patrick this weekend and am supposed to bring a traditional Irish dish. I was afraid that I wouldn’t be able to find an authentic recipe. Well, I certainly have! Thank you also for responding to Ann’s response. I would prefer to use cabbage over kale, but wanted to be sure it was just as traditional. Happy St. Pat’s to you! Hi Katherine, my husband and I, and cousins are heading to Dublin in 8 days [yay], and being as I love food and enjoy trying different foods, came across your site. There are 16 of us heading your way, and wanted to ask you if you could recommend any places to eat [notice I didn’t say restaurants]. We have never been out of the U.S. [except for Canada] and we are truly excited about this trip. We are plain folk, and aren’t interested in any fancy food places. We’d rather go where the locals go. Being a “senior”, I will give my email address, in case I can’t find this site again. Hope to hear from you soon! Colcannon is made in Ireland with Curly Kale, not cabbage! We eat it in Dublin at Halloween and we make it with mashed potatoes, onions and Curly Kale, nothing else, and usually serve it with boiled ham or bacon. The thoughts of putting bacon into the mix is not normal here, so I can only persume that the recipe has dwindled through its travels and the old ingredients being replaced with local ones available. Thanks for your feedback, but you seem for some reason to assume that this site is not Irish based, it is!! I am in Ireland (Kilkenny), was born here (Dublin), bred here and never lived anywhere else. I think what you say just goes to show that there are as many recipes as families when it comes to these traditional dishes. We never used kale in colcannon, always cabbage, and we ate it at all sorts of times, not just halloween. I don’t think these kind of things are written in stone. The addition of bacon is not, as I pointed out, traditional, it’s just something I do from time to time. But it’s very tasty and makes colcannon into a quick and tasty standalone meal, you should try it! Anne are you REALLY Irish??? The recipe above clearly states cabbage OR kale, so the author hasn’t left it out. I’m from Limerick and my mothers from Galway and we made colcannon with kale OR cabbage as it was more readily available all year round. When kale was ready in the garden then we used that until we where all out of the crop then we’d use cabbage again. We did make colcannon at Halloween with kale but we’d put coins and rings wrapped in greaseproof paper in it as is tradition but if you only made this at Halloween then you where missing out!! And bacon is actually really good if you want to serve this on it’s own as a meal in itself without the hassle of boiling the ham but as the author points out its not really traditional. Basically colcannon is normally made with kale but don’t panic if you cant get any as savoy cabbage is a good substitute that even the “real” Irish use. And by the way kale belongs to the cabbage family! 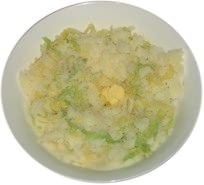 Hi all, thought i’d add my “two pennies worth” to the “modern” colcannon recipe variation. Cook the cabbage on a low to medium heat in butter with sugar and vinegar added to taste (sort of sweet and sour) for about 20-30 minutes until the cabbage is just starting to soften. Meanwhile, boil the potatoes. Chopped onion or spring onions/scallions/bunching onions can be added to the cabbage at about 5 minutes before it is starting to soften. Mash the potatoes and mix in the cabbage, using the liquor from cooking the cabbage to make the potato really smooth and creamy. It can be served as it is or put into an oven proof dish with or without grated cheddar on the top until it’s just browning! On it’s own as a tasty snack or meal, or as an accompaniment to roast pork or boiled bacon, with an onion sauce, delicious!! Something my dad used to say to me when i was a kid – “Cabbage and bacon vindictively taken, the night O’Raffertys pig ran away”!! Don’t know if this was the entire saying or part of a poem, but it’s food for thought!! We had an Ethnic Dinner Party several years ago, and I made Colcannon, and this was a great hit. Being mostly Irish, I now understand all the good recipes made with potatoes. The second recipe is very close to the one my mom would make when I was a girl (she used very little cabbage though…..lots of cheddar….and green onions instead of the leeks). It was a favorite of mine! I’ve never “made” Colcannon, however my one of my favorite parts of corned beef & cabbage has always been to mix the potatoes and cabbage and add butter. I’ve been doing this since childhood. Thought it was my own concoction! Being that I’m half Irish, I guess I was just born to it. Now I’ll just have to make it “for real”! I made colcannon for the first time on St. Patrick’s Day. It has to be one of the most wonderful dishes I’ve ever had. I’ve never had it before but it will be a staple in this house from now on! Get occasional updates with news, events, offers and more to help you plan a vacation in Ireland.